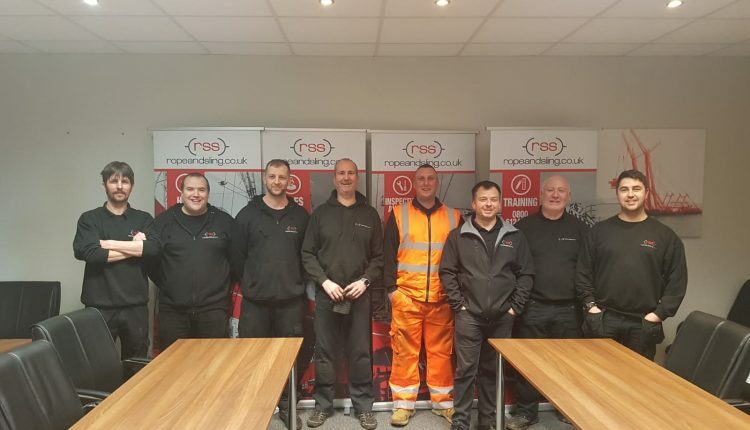 A delegation from Rope and Sling Specialists Ltd. (RSS) completed a course on the design, installation, and inspection of a popular fall arrest system, delivered by 3M, a provider of tools and software to support workplace personal protective equipment (PPE) safety training needs. RSS, which offers lifting equipment and related services, supplies a variety of harnesses and other PPE to a myriad of marketplaces from its six UK locations. The latest training course was delivered at its facility in Bridgend, Wales, the company’s de facto headquarters, and covered installation of the DBI-Sala 8mm permanent horizontal lifeline system from the 3M portfolio. Each attendee received a certificate of participation, valid for three years. The course was split between the classroom and practical sessions, during which participants had an opportunity to install the safety system. The course was delivered by Phil Hughes, 3M’s trainer for all horizontal lifelines, who was joined by Kay Ramsden, engineered system sales specialist, who is the lifeline’s sales specialist for the UK and Ireland, and will be RSS’s principle point of contact moving forward.